For the past six months, Sean and I have been spending most of our nights observing black widows in their natural habitat on Vancouver Island, BC. We did a couple of short experiments during our time in the field, but the vast majority of our work involved simply observing the spiders as they went about their business. The goal was to get a better understanding of the natural behaviour and mating dynamics of this population. This kind of basic natural history research (as opposed to experiments designed to test specific hypotheses) is not often done because it can be challenging, time consuming, and expensive, and is looked on by some as not as important as hypothesis-driven research. I think this is a shame, because there is still so much waiting to be discovered if we only take the time to look. And it is easy to overlook amazing and potentially important phenomena if we don’t take that time. It’s also easy to make incorrect conclusions about the way the world works when we rely only on experimental data and don’t already have a good understanding of the natural history of the organisms we are studying. Let me tell a quick story. You may recall that last year our study about web reduction behaviour in black widows was published. (Here’s a plain language summary of the research). 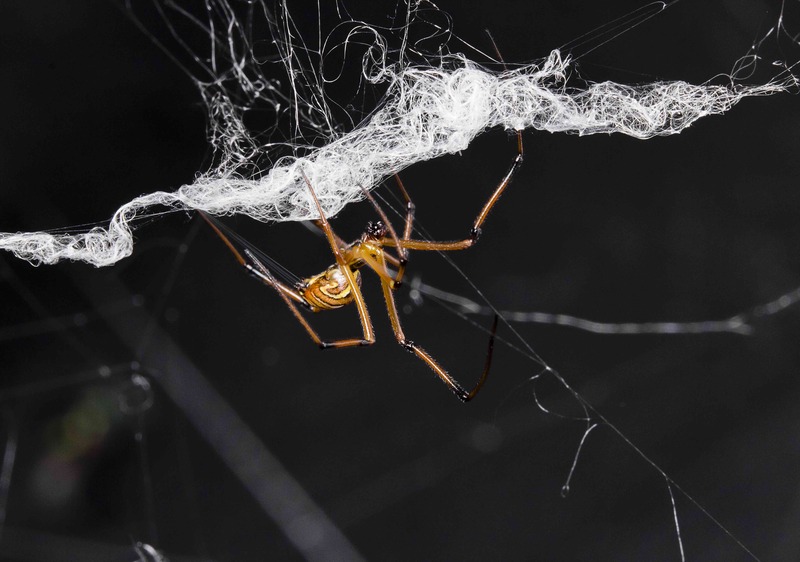 Based on observations of sexual behaviour of black widows in the laboratory, we knew that males often engage in web reduction when courting on the webs of virgin female. The male cuts up sections of the web, bundles them up, and wraps them with his own silk. We wanted to know the function of this behaviour, so we ran some carefully designed experiments in the field, and concluded that web reduction allows males to avoid competition by decreasing the attractiveness of the female’s web. We assumed that this is a common tactic used by the first male to arrive at a female’s web, in order to avoid other males from finding the female and interrupting his courtship efforts. I was looking forward to learning more about web reduction this summer as we observed black widows behaviour across the course of a mating season. Guess how many times we observed web reduction in the field? Exactly once. All our laboratory observations were of males introduced onto the webs of adult females. It turns out that in the field, males mature before females do, and most of the time they arrive at a female’s web before she is sexually mature (and before she has the attractive chemicals on her web that trigger web reduction behaviour). Our previous results were not wrong, but without this year’s fieldwork we might never have realized that by focusing on sexual interactions between males and adult females we were missing a big part of the story. How males find immature females, and their behaviour once they do, is likely much more important for avoiding competition than web reduction. 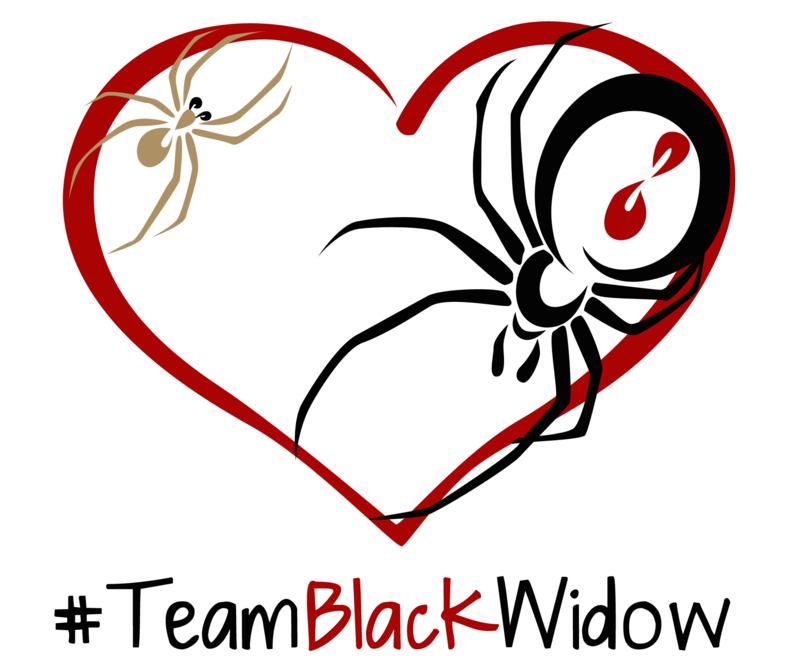 There is so much we still don’t know about black widows, that’s just waiting to be discovered! I feel extremely lucky to have had the opportunity to do this fieldwork as part of my PhD research. Spending six months in the field is very expensive, and a bit of a risk scientifically, because exciting results are definitely not guaranteed. I will likely not have the opportunity to do extended natural history fieldwork like this again, because funding for basic research is increasingly hard to come by. Government funding for science is more and more focused on applied work that has clear benefits for the public. The problem with this model is that future applications and benefits of basic research are often difficult to foresee. In my case, there are some obvious potential applications of studying chemical communication in widow spiders. Some species are invasive or considered pests in certain areas (including vineyards in BC), so a way to control them without using harmful pesticides would be very useful. 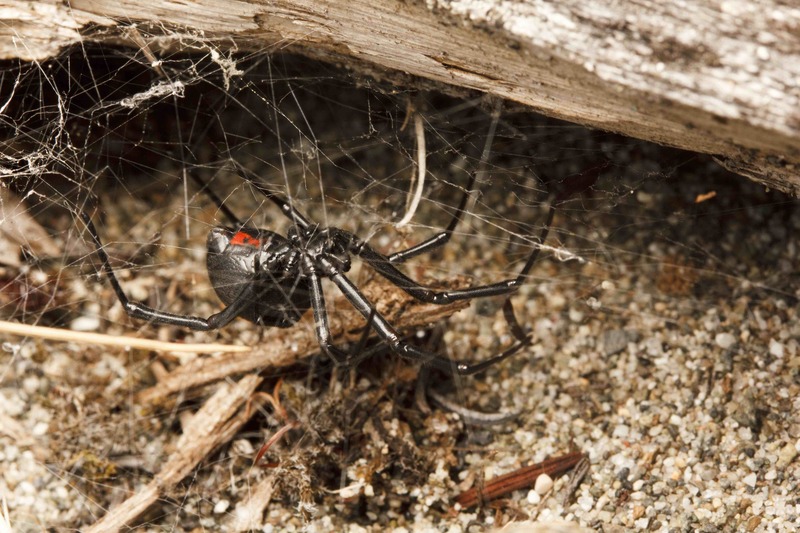 Once we understand how male and female black widows respond to one another’s chemical messages, and the identity of the chemical compounds involved, we may be able to develop ways of using these naturally occurring messages to trap and remove spiders from areas where they are a problem. Partly because of this, I think, I was successful in securing an NSERC scholarship to do my PhD (thank you Canadian taxpayers!!!) but even so, I am not exactly drowning in money to support my research. The rest of my PhD work will take advantage of the excellent understanding we now have of how black widows actually behave in nature. I will be able to design laboratory experiments that are as naturalistic in context as possible, and use what we now know based on this year’s field observations to make well-informed conclusions. However, to really understand how chemical information affects black widows over the course of their development and their mating interactions, the best place to do the work (both experimental and observational) is in their natural habitat, and this is where the title of the post comes in. If I had my wish, next summer I would go back to the field for four months (the full mating season) to do experimental and observational studies of black widows that will improve our understanding of their chemical communication. Our lab’s funding is sufficient to pay for travel to and from the field site and for the basic equipment we’ll need to do the research*, but there’s one problem. It’s simply not safe to do the work I have planned (often at night) alone. I will need a field assistant, and that field assistant will need a salary. (Volunteer field assistantships for this kind of work do happen, but they are bad for science, and not an option we would consider.) I can and will apply for several graduate student research grants, and if I am successful these will help defray the costs of the planned fieldwork. Unfortunately, most of these explicitly do not allow the funds to be used to pay salaries. That’s where you come in! *UPDATE: Here is a note on our campaign page where my supervisor explains the funding situation and why we’re asking for money in a bit more detail. The logo and hashtag for the project. Logo designed by The Vexed Muddler. 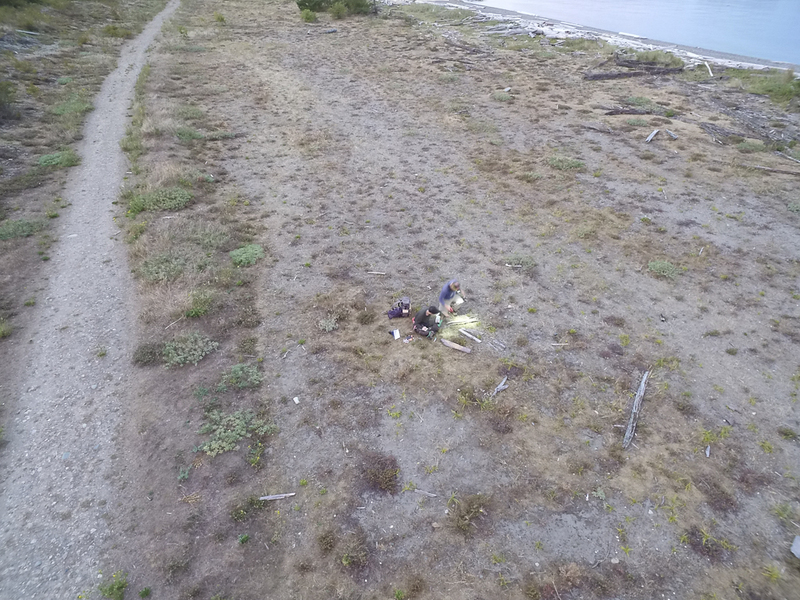 For the next 30 days, Sean McCann (who was my field assistant this year, and who will continue to collaborate on the project one way or another), my supervisor Maydianne Andrade, and I will be running a crowdfunding campaign on Experiment.com as part of their Arachnid Challenge. We hope to raise the $6000 USD (the salary of a full time field assistant for four months) that we would need to make my plans for another season of black widow fieldwork a reality. This is an opportunity for anyone to support and participate in our research. If we are successful, we will post regular updates about our plans and progress, and share stories and photographs from the field. Please check out the campaign page for more details, and consider donating. Even $5 will make a difference, and everyone who contributes will receive our heartfelt thanks and be acknowledged in all publications and presentations resulting from the research. If you donate $15 USD (about $20 CAD) or more, we are offering various tangible tokens of our very deep appreciation, including swag with our fantastic logo (designed by the brilliant Vexed Muddler) and prints of Sean’s beautiful photographs. Even if you cannot support the project with a donation, I would be so grateful if you would consider sharing the campaign with your friends and colleagues on social media, email, or in real life. The more people we reach, the more likely we will be to reach our goal! Thank you so very much in advance for your support – we really appreciate it!!! This entry was posted in behaviour, my research by cataranea. Bookmark the permalink. Hiya Catherine, I’ve pledged a few quid, hopefully you get to your target. Think I’ve got a ton a black widows living in Port Moody, bc. Super shy always under ledges and surrounded by a grave yard of dead n empty wood bugs. Never can get an look under there belly’s but there spitting images of widows.. did find one on the floor of my hall way. Scooped him up with a container and let him go out side.. top side not shiny but matte with a scaly black design.. spitting image of a widow except shinyness. Just found out hour Glass is underside not top so didn’t cheak. Sounds awesome! Could you try to get a picture of one of your spiders and email it to me? I’m very interested to find out if they are actually black widows or the look-alike false widow (Steatoda grossa). Thanks!